but in the past 3 or 4 days, I've written two new lyrics... just spent a couple hours writing some music for lyrics by Lloyd, also tonight I put together a reference track for a song I'm producing, and sent it off to my drummer... had a nice potluck & song circle on Sat night with my songwriting circle... walked the past two days, got groceries, tidied up the kitchen... worked on a newsletter for one of my clients... surfed the songwriting boards... and just got asked to do another collab by a lyric writer... guess folks like my music... LOL...(but they'll have to wait til I finish my other projects!) ...also I practised the guitar. PS - my Dad was released from the hospital today... 8 days after his collapse, he's doing pretty good, I'm very relieved, I can tell you. I was blind-sided a bit this week by the news my Dad was in the hospital... thankfully, resilient man that he is, he bounced back pretty well. He'll need some TLC for awhile, but will be released this weekend. Needless to say, everything in my life that once seemed so essential became totally unimportant... and I had a hard time focussing on the things I needed to get done. But news is good now, and I have to get myself back to working steadily to finish the projects I am currently working on. Where am I now? Well, I've been back from LA for a week, and been playing catch-up on a number of things. Had a couple of newsletters to put out for clients, my students to catch up with, five loads of laundry (who invented laundry, I'd like to have a chat with him), trying to make some jewelry for a craft fair, and getting one of MikeK's & my songs into production. Also had lunch & dinner with my Mom, went out for dinner with songwriting friends yesterday, did the craft fair today. So not much music happened this week! - oh, one more - my freelance client will need some stuff from me in the next week or so. A few hours work. I'm tired now, LOL I'm going to go to bed. Oct 30/05 - okay, I confess... "I am the Great Procrastinator" - picture me looking very haggard... at 3 am... still burning demo disks... trying to fit everything I need to take into one small carry-on bag. 3:30 am - press kits done, lyrics printed, copies of contact info, itenerary, demos labbells & ready... pillow stuffed in my guitar case to help me sleep on the train... make-up bagges... music collected into one place. I go to bed, mind racing. Alarm goes off at 6:45. I get up and turn the computer back on - there's one set of lyrics I forgot to print. The computer clock says 5:45 am. I think, 'hey, did something go wrong with the computer?' Then I realize! The time changed, you idiot!! Well, instead of going back to bed, I decide to print off the music for two more songs - and I forget to get someone's contact info. Check my email - good thing, too, got the name and number of another contact in LA. By the time I finish that, it IS 6:45. Wash hair, do dishes/tidy kitchen, have bath - and cut myself shaving. I stand in the tub with wet hair, red stuff dripping from my ankle into the draining water, try not to panic. Run cold/hot/cold water over it... it slows... get out of tub and dab some kleenex on my ankle.... no, I don't need to go to the emergency, I just scraped the skin off. I put 3 bandaids over it, do my face & hair, see it's now (really) 7:45... I'm heading back to my bedroom to get dressed and the phone rings... my songwriting partner is on the doorstep. "I'll be out in five minutes," I gasp... reluctant to say I'm as bare as.... I throw on clothes, throw out garbage... grab purse, guitar & bag... and we're off! Sun Oct 30th/05 - 8:12 pm - Hey things worked out pretty good. Arrived Van Bus depot at 11:30 pm, picked up my train ticket, caught a cab & was in my room at 12 noon - they let me check in early! It was pouring with rain - and you'll never guess what was happening (and is still happening) at the hotel when I arrived! Long trucks... tents... lights... cameras... yes - they are filming a movie. When I woke up from my nap, I could hear them calling... "Rolling"......... "Cut"...... - I had to laugh! Mon Oct 31st/05 - 5:40 am - slept fitfully... the movie folks had lights shining so bright outside the hotel that it gleamed in my window like bright sun. I was afriad to take a shower before bed because they didn't like the fans going in the bathroom. I was too tired to play the guitar as I had planned anyway. Fell asleep around 10 and slept til around 2 am, then dozed on and off until 4:30. Got up and had a shower, dressed, checked with the cab co to be sure they'd be picking me up as ordered at 5:20 am. When I went downstairs, he was there waiting, and when we got to the train station the bus was already there. I pd for the cab with Cdn change so I don't have to cart it around for 2 weeks. The bus driver didn't bat an eye at my guitar and two bags (I had been told very emphatically that you are only allowed 2 pieces of carry on luggage). Last night I reorganized by stuff and managed to get my press kits into my overnight bag with all my clothes. So my shoulder bag is much lighter and has more room. I was really tired, but it occurred to me that I'd be getting up at 5, getting on a bus at a train station where everything is closed, and there's no coffeemaker in my 2 star hotel room... so the chance of getting something more than water to drink, or getting something to eat... was not going to happen until I got on the train at 10 am in Seattle. So I ordered some chicken souvlaki for delivery... when it came, it smelled great... but then I realized I had no utensils... and the hotel kitchen was off limits due to filming... so I sat there on my bed eating roast potatoes and chicken and greek salad with my fingers. Very diva. Just part of the adventure. Oct 31st - 7:10 am - at the border... I don't know why, but I always get nervous dealing with officials. I plunked down my id & form in front of the grim young border guard, and he asked me where I was from (Victoria) and where I was going (Hollywood), who was I visiting (going to a music conference called the Taxi Road Rally)... "and how will you be participating in this conference?" he asked - that was the last question I expected (meanwhile he was looking through the passport of the woman in front of me - who he'd detained)... I stammered... 'going to seminars... on things like marketing your music'... (I searched my mind)...' writing good melodies'...(I felt like that wasn't enough but couldn't think of anything else)... finally I blurted: 'writing good lyrics'.... he never looked at my face once through the whole thing... passed my id back and said, see you. 2:05 Portland... I dozed & listened to music and watched scenery and then finally decided I should go to the snack bar and grab a tea or something. When I got to that car (it ajoins the dining car), I decided I would check out the menu for the dining car... I was surprised to find it cheaper than I expected. I sat in the observation car a bit, wanting to get a table by myself so waiting til they were empty. So I go in, and he seats me opposite this obnoxious women... let's see... she's hung over... wants grilled cheese but it's not on the menu... she has panic attacks... her mom passed away earlier this year... her brother-in-law abuses kids - I'm practically upchucking as she describes what her nephew said the dad did... I mean, it is terrible and disgusting and I sympathize but geez .... I'm just there to eat lunch. Nov 1st - 4 am - I see stars! I think we might be in, or near, California! Can you hear me singing? Of course the wee aisle light falls directly on my chair. My feet hurt for some reason. But I slept pretty well. I'm waiting for dawn. I wonder if I'll be able to read this in daylight. (Nov 1st - con't) I'm so pleased to see stars because stars = no rain! It's been raining steadily since I left Victoria yesterday. Too bad there's no moon. I remember crossing Canada by train, and the moon was so big and bright you could see the land in its silvery glow. The people I sat with at dinner were NICE. Thank goodness! A woman and her cute grandson, and a gentleman in his 70s. They were all going to the same place but didn't know each other. I keep thinking I should write some lyrics but nothing comes to mind. There's already some great train songs out there, LOL. Yesterday afternoon I was listening to my demo and I think I fell asleep just before "Alien" came on - that was kinda spooky. Hey, I see the Dipper! Oh, what to sing if I get to sing at the Rally Open Mike. Of course it's such an opportunity you want to do it right. I hope I can access the internet at my hotel and update my blog. If not, I'll have to find an internet cafe or wait til I get home! Here's a good lesson for a songwriter: when I phoned Amtrack to buy my ticket, the woman emphatically said I could only bring 2 pieces of carry on luggage a la airline bags, we'd be crossing the border early and something about no baggage handling. So I bought a shoulder bag that could double as a purse (I can stick my purse inside it), and then I have my carry-on bag with my cloths, demos & toiletries, and my guitar. When I got to the bus at the train station in Vancouver, I noticed there were larger bags being stowed in the bus luggage compartment. I was pleased the driver didn't bat an eye at my '3' pieces of 'carry-on'. Folks got off the bus in Seattle and grabbed their big suitcases and headed into the station. While I was waiting in line, Amtrak made an announcement re only 2 pieces of carry on. So I finally copped -- you can have luggage -- but what you take upstairs on the train is restricted to 2 pieces. But that's not how it came across. An excellent example of something being very clear to the person who understands it, and not very clear at all to the person they are supposedly communicating it to! Maybe it's better... I'm travelling light because of it! 8:00 am - beautiful scenery south of Sacramento - watched the sunrise ealier - and saw my first palm tree at 6:30 am PST! Had breakfast - believe it or not - with a WRITER who also seemed to be a knowledgeable tour guide, an ACTOR who works in rep on Oregon doing Shakespeare & other plays, and a 16-year-old who left home at 13 cause of his mom, but thinks his grandmother - who adopted him - is an angel. He also said his grandmother is a saint, she's never done anything wong, never told a lie. I sat there thinking my co-writer Mike K would love to hear this - just proves that our song, 'She Was Always There', can be very meaningful to a lot of people. 9:30 am - Oakland, CA - here's where we transferred to a bus cause they are working on the tracks. I'm on the bus, in the front seat - beautiful day! Feel much better today. I've had some sleep and some food and I'm in California! Mind you, I still fall asleep at the drop of a hat. Hey - everything here is green! 10:30 am - San Jose - how beautiful! I slept all the way here! 10:45 - back on the train - boy is it hot here. I'm glad I brought my shorts! Okay, we're moving - LA here we come! ...just changed out of my West Coast Canada winter wool pants into something lighter - whew! I'm told it's even hotter 'down south'. 12:15 - well, we found our 'way to San Jose' and now we're coming into 'Salinas, Lord' (that's from Me & Bobby McGee), We passed this beautiful long leg of water with flocks of birds and little streams winding thru grass near the shore... I saw what I took to be big birds of some kind... and then I realized they were seals - so it must have been the ocean! I'm noticing the beautiful Spanish-style architecture around here. Been thinking a lot about the Rally and I think the best way to go in is to, just like I did with my opera audition, just as me. I ain't what they're looking for. Talk to folks, have fun, play music - just forget about anyone in the industry lookin' for me. Can't wait to practice the guitar. When I get checked in tonight! It's writing good melody I need help with the most, I've been thinking. My lyrics are much better becuase I understand prosody and I also understand that you have to boil it down to the kernels. 8 pm - somewhere outside of LA. Starting to feel excited (or maybe it's just that I allowed myself dessert - vanilla ice cream). Met a nice couple in their 50s going to Disneyland again (alone, no kids!). That's the spirit! I keep thinking it's Monday today, but no, it's Tuesday, and I'm 'working' for Taxi tomorrow afternoon at the Rally Hotel. All I plan to do between now and then is... call my Mom, have a long cool bath... and get a good sleep, pick up some groceries. Thursday I'll do a little exploring before the Rally starts. 9 pm - Simi Valley... as usual a woman on a cell phone just behind me... sigh. Why not go to the club car to do that? Folks are sleepin' and don't want to hear 1/2 of your loud conversation about your friend's relationship with her husband! 9:40 pm - nearly there! Actually took the guitar out and played that riff I've been working on a few times - sounds nice. Apparently we've been thru Burbank, home of movie studios. Just wanna get to my hotel room in one piece! I see the station! Nov 2nd - Wed - 7 am. Sittin in my hotel room looking out at palm trees and Hollywood hills! I'm here! I have to admit, when I got here last night, I didn't feel at all like the "cosmic diva". I was hot, tired, a little worn out. I tried to call my Mom but couldn't figure out the phone.... just as well. I unpacked my clothes and hung them up and then just sat on the balcony for awhile in the cool air. I tried the air conditioning - which I don't much like (dries the throat, you know) but it didn't seem to be cooling the room much. So after a long tepid bath I opened the balcony doors and lay in shorts & t-shirt on top of the huge and comfortable bed - and slept for awhile. My suite is great - king size bed, 2 easy chairs & a beautiful side table, a dresser that holds the TV. In a separate room is the kitchen & dining room. I've got a huge closet for my 3 outfits, and a nice washroom, plus the balcony with garden furniture. It looks over the parking lot, of course, but like I said, I can see palm trees and Hollywood hills. The sun is behind me - at the front of the hotel - so I likely face west. I forgot to tell you - the train station is fabulous! I know I've seen it in many films! Gotta pick up a disposable camera! I think I'll walk down to the tourist info center that is nearby. I need a local map. 9:45pm - Wed Nov 2nd. What a day! I started by walking around the block and did the Hollywood Boulevard stroll - the Chinese Theatre is not like anything I imagined - and they're having a preview tonight! They were laying out the red carpet and everything - I must admit I'm overwhelmed by the gloriously shabby old buildings. I walked from Hollywood & Highland to Ralph's grocery store on Sunset Blvd - my gawd the sun was hot and it was nearly noon - the worst time to do that. Spent $24 on groceries and took a cab back to the hotel. Had a quick cool bath and hightailed it over to the Rally hotel, to help the Taxi folks stuff bags for attendees. I was required to walk round and round a line of tables to make-up packages. We started at 1 and by 2:45 I'd had it. I wanted to quit but it looked like it wouldn't be much longer - and we finished by 3:30. Had conversations with 2 or 3 people - I'll have to do better when I meet folks in person at the Rally, cause I stammered over who I am and what I do. When I got back to the hotel after having some excellent pizza - I was so exhausted I just lay down watching tv and thinking for a couple hours. Then I played guitar for an hour - that felt better (always does). I went over and watched folks arrive for the preview but I couldn't get close enough to see anything much. My friend & collaborator JamesM called this morning! We'll have to connect tomorrow so I can tell him about registration. Tomorrow I plan to rest, make some phone calls, practice guitar. 11:15 am - Thu Nov 3rd. Sitting in the AMAZING lounge of the Roosevelt Hotel. The ceiling is, I think, art deco, the balconies are like something out of the Arabian nights. Even the furniture - black leather - seems like it is from a different world. There's a definite Moorish feel to this a la Rodolph Valentino in a glitzy Hollywood way. The chantileer is enormous and the light fixtures are flower petals. There's potted palms by the columns and a fountain in the centre. Had a nice long chat with JamesM this morning, gave me lots of ideas of where to go. I decided though, to spend a fairly leisurely day, so I'm just strolling a little, and have a ticket for a one-hour trolley tour at 12:30. After that I'll go home for lunch & a nap (can't believe I still feel tired) before getting ready to go over to the Rally hotel for registration. 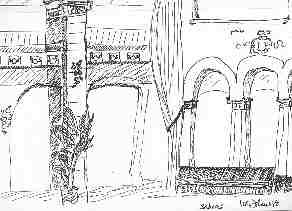 I tried to draw a pix of the Roosevelt lobby, continued my Hollywood stroll. Elvis Presley shook my hand, he wanted to take a photo with me, but I said I didn't have a camera with me - I should have said 'I charge for that' LOL. Nov 4-05 - well, what did I learn today? How CONFUSING the music industry is. In one room, they said 'be unique'. My mentor seemed totally lost when he heard my Alien piece. He was complimentary of the production but didn't see how I would market it. He said, in order for 'Alien' to work I need to have a rythm track that builds & drives, and a melody that pulls you through so the creative stuff accents. To give him his due, he's a pop/rock management person. I don't know if he knows much about electronica. I feel I made the wrong choice of song to play him. He also listened to 'Send Me a Man', and didn't like it much either. He liked the chorus, but thought it was long/wordy. Verses 'too safe' need to 'play more'. I think he thought I was creative, but I didn't really learn anything, nor did he look at the press kit I so carefully created. Bummer. I listened to another speaker for awhile, then went back to my room & played guitar for awhile. Later I had a nice dinner with James at Hamburger Hamlet, and then we jammed for awhile in the hotel hallway, workin on a piece of mine and a piece of his. That was fun. I got some nice compliments, so that makes me feel better. Today was up and down for me. ~Nov 5th-05 - DIY panel (do it yourself) was very inspiring - I'm doing a lot of that already. I had a GREAT 'mentor on the go' session with Pat Pattison - he gave 'Waiting for the Bus' a wonderful review, verses have great imagery, he said, he thought I could simplify the chorus, he liked the Ab9 riff but thought it would work better as a prechorus. That made the whole trip worthwhile! I also found the A&R panel interesting - production on the songs played was often great, but songs didn't make it due to problems with structure & form. Maybe only about 5 good ones, which surprised me a lot. A&R shooting gallery was interesting too. After that James took me up to Universal Citywalk, which was like nothing I expected. I was thinking, like Gastown in Vancouver (heritage buildings with shops & cafes)... instead it's like an all neon food fair with a few souvenir shops. I did sing at the Karaoke booth, though - 'My Heart will Go On' - to enthusiastic applause. Nov 6th - today we have Music Library panel, hit songwriters, & then music publishers. Tonight I'm recording with James. Had a GREAT 'mentor on the go' session with Randy Sills! He listened to 'Alien', thought it was neat, said it was definitely ambient electronica & gave me a huge amount of marketing advice. I hope I can remember half of what he said!! ~Nov 7th - feeling lonely today, after all the companionship & busy-ness of the weekend. On Fri I wasn't sure if the trip was worth it, now I have to say it was. I talked one on one with 3 mentors, all of whom listened to my music and gave me feedback, I met a music publisher, chatted with many folks, had a great time with JamesM, had a session in a LA recording studio (and the engineer asked for my card when I was leaving!) - a lot happened in three days.